Ralph has been with the company since 1975 and manages all aspects of the hydrograsscorp.com parts department. 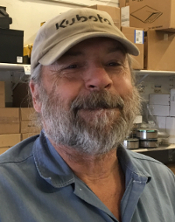 Day to day Ralph works with FINN to ensure that our parts department is stocked, he takes orders and ensures they are shipped promptly, quotes parts, manages inventory of parts, works directly with our remote part locationsand assists customers with anything parts related. He works at our headquarters in Pittsfield, Maine and can be best reached @ 1-800- 451-8838 or parts@hydrograsscorp.com.